One of Adidas' biggest technological advances over the past few years is still trying to find its footing in the sneaker world. 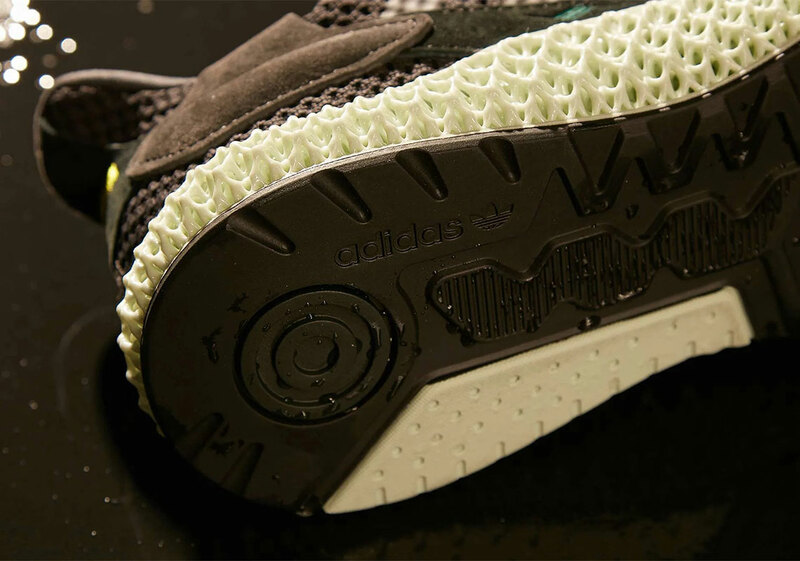 This technology, of course, is the implementation of 4D printing in the midsole. 4D printing employs the same principles as 3D printing, except 4D printed objects have the ability to transform. This is a crucial difference as the 4D midsole allows for the same springy and energy transferring feel that Boost does. While it still remains to be seen if 4D can be as comfortable as Boost, sneakerheads are intrigued by the concept and the potential. As part of their 4D series, Adidas has created a new model called the ZX4000 4D which has a brand new colorway dubbed "carbon" coming out this weekend. The carbon-colored upper sits atop an "ash green" midsole that has become standard for Adidas' 4D offerings. Small highlights of green and yellow can be seen throughout the shoe, although overall, it's a pretty muted colorway. Thanks to the high-tech design, these will be going for a steep price of $350 USD and will be released on Saturday, April 6th, according to Sneaker News.